Sub 10-150, Low Bass Subwoofer - amazingly compact. 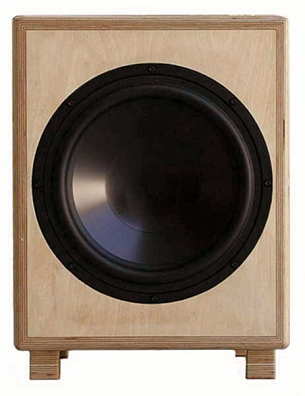 More and more customers are asking for a subwoofer where the cone's oscillation is controlled perfectly, reproducing a low bass and mountable in a small cabinet. Bass driver with a very strong magnet and a very stiff and rigid cone, ensuring a controlled oscillation. A unique low bass control is added. The subwoofer is then combined with an amplification module with a very high power output. The Alcone AC 10 SW4 bass drivers is deployed in the Sub 10-150. The driver is manufactured to the highest standards, ensuring first class control over the cone through their strong magnets. Particularly the strong drive combined with the low bass tuning, turn out a sound quality which is generally only possible with larger sized cabinets. The principle of low tuned subwoofers with extremely strong drive are at the moment being adapted by manufacturers of finished loudspeakers. 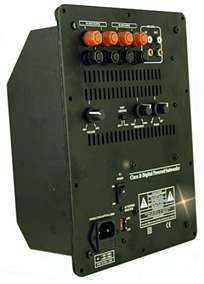 The RCM Detonation DT 150, amplifier module is located at the rear of the cabinet. The module features state-of-the-art Class D amplification ensuring enormous power output with top quality sound, fitted in a small cabinet.